Unfortunately, I haven’t had time to finish my post about day 2 of Yosemite. But, the good news is that’s because I am in Denver to buy a new (to me) Lazy Daze! Lately I had been thinking of carrying a scooter on the back of my rig, but CB (my Engineer friend) advised against it, as the structure underneath didn’t seem strong enough to hold it on a hitch-mounted ramp/rack. A welder I went to see in Santa Fe agreed. I started thinking of upgrading to a 26′ Lazy Daze, both for beefier structure/power and for more room. I didn’t buy my Lazy Daze originally with plans to full-time in it. I planned to have it for a few years, try it, learn the systems, see if I like it, then get a larger/newer rig when I retired and started full-timing. But, things don’t always work out as you planned, and now here we are. On the road full time…. 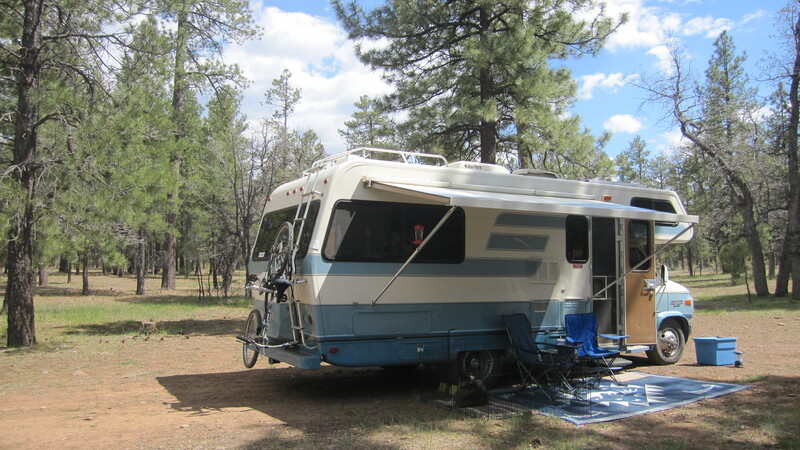 Anyway, I got to thinking about getting a larger Lazy Daze (mid-bath floorplan) and almost immediately saw one for sale near Denver. Wow, what luck! 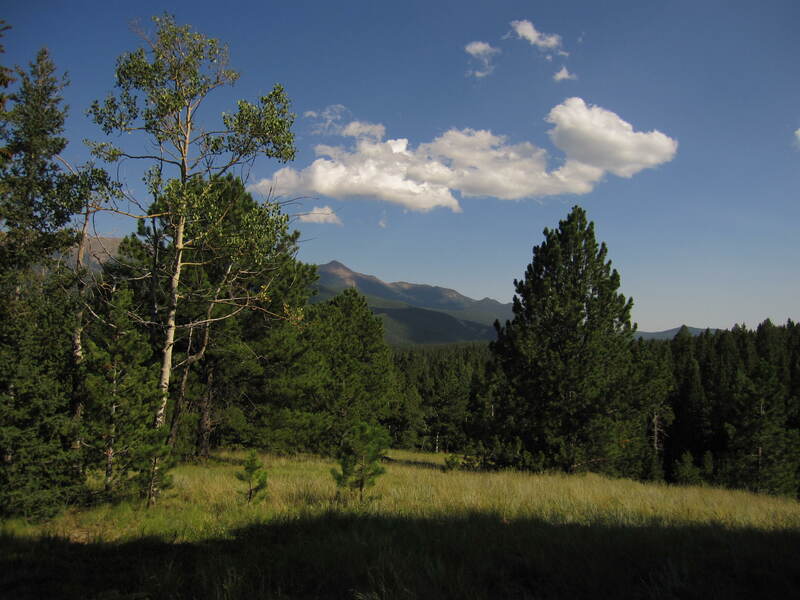 I was in Salida, CO, only about 150 miles away. It sounded like a good candidate after talking on the phone with Cliff, the owner. Chris mentioned it to our friend John in Colorado Springs. (We met him and his wife, Linda, in Quartzsite in January). 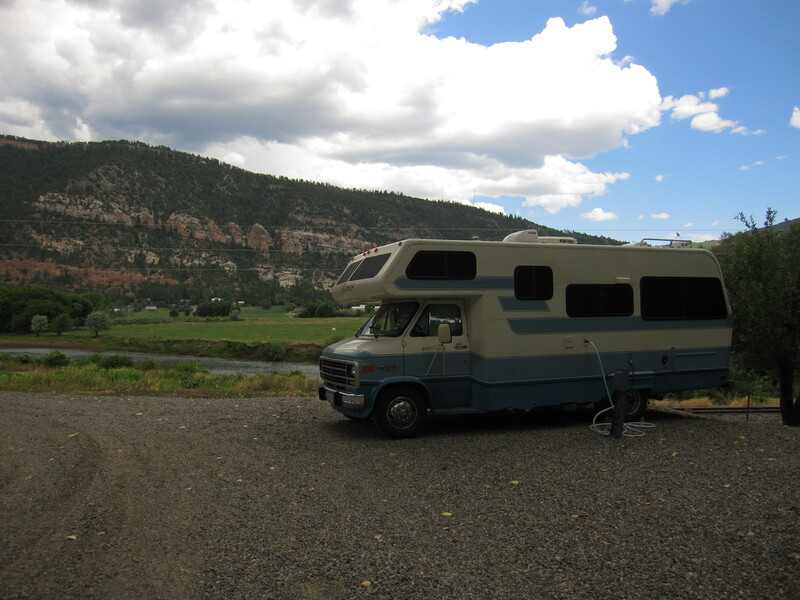 He happened to be going right by there on the way to the Denver airport this past Friday morning, and offered to take a look and tell me if it was worth driving my rig over from the spot near Nathrop, where Chris and I were camped. He looked it over, said it was in good shape and was worth making the trip in person. So, I got my stuff together right away, drove over to Denver, met with Cliff Friday afternoon, checked it all out, and started working on a deal. 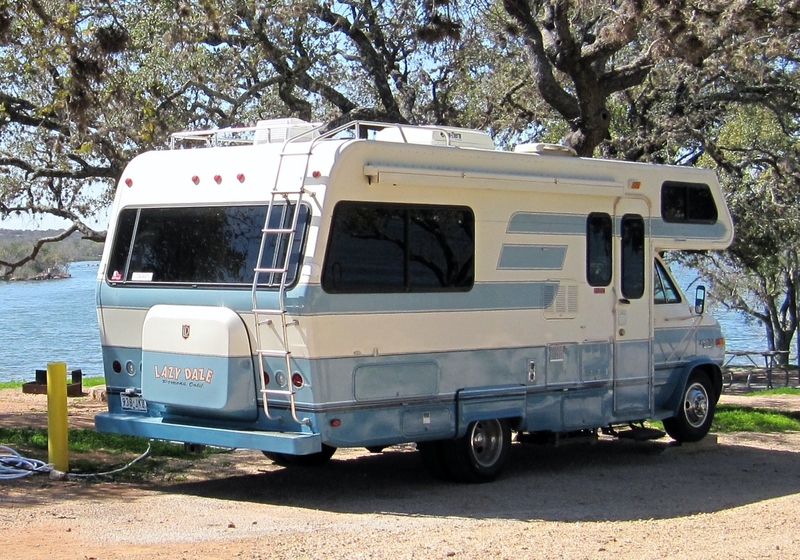 We just finalized the agreement Sunday, so now I can say I am about to have a new RV! I expect to be able to finalize the transaction and pick it up on Thursday. So excited! So we left Mueller and headed to Colorado Springs, then on to Denver. Bev had a flight back to Austin on the 8/22 so she could be back a few days before school started on the 27th. 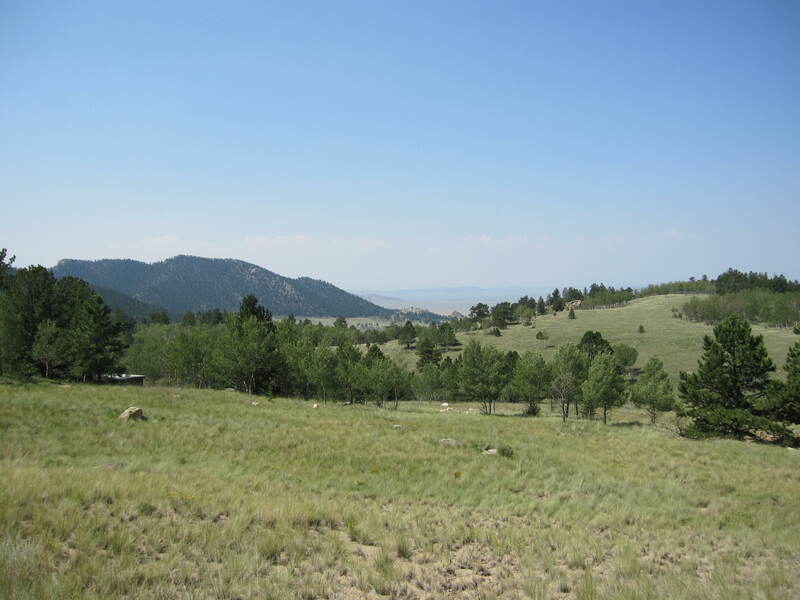 We figured we would get a site at Cherry Creek State Park, which is in Aurora in the Denver metro area, to be close to the airport. We thought we would get a rental car using my brother’s special rate (he travels a lot for work), but the company had no cars. I checked Enterprise and several other companies, but the rate was over $50 per day. We didn’t really have anything planned to see/do in Denver, so it seemed a bit spendy to get a $50 car, then figure out what to do in the area. We really wanted to not travel for a couple of days, get some laundry done, make sure Bev was all packed and ready to go, etc. So we hung out at Cherry Creek. 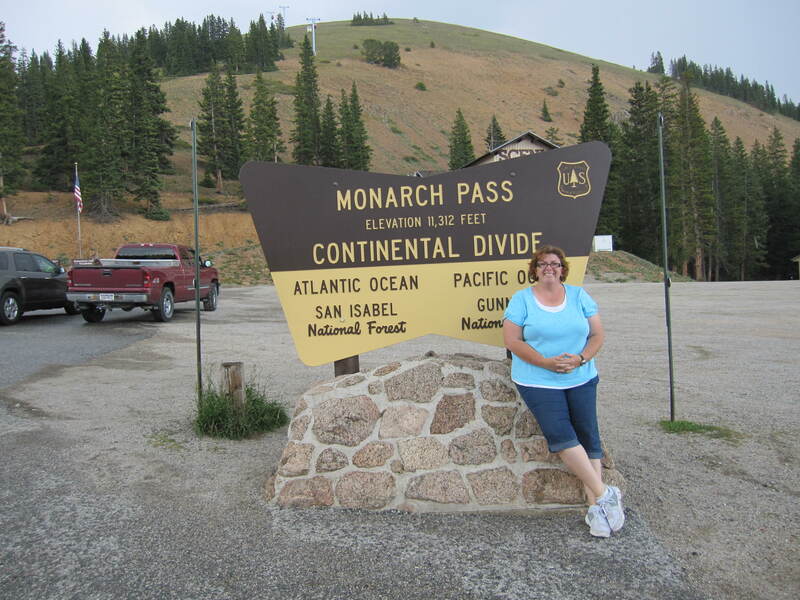 While there I spent some time researching Yellowstone and Grand Tetons National Parks. 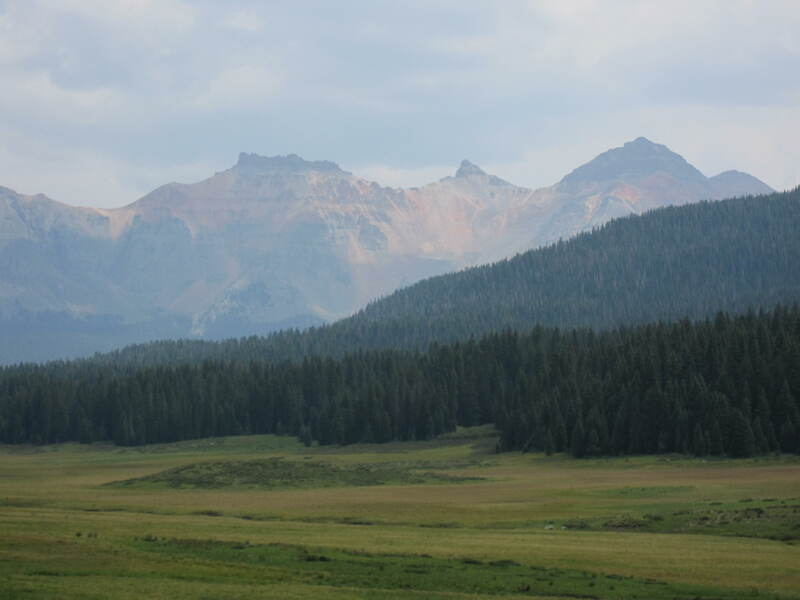 When I knew we would be going to Denver, I figured it would be good to go on to Wyoming and visit them, which I had wanted to do for a long time. I had picked up a Yellowstone/Grand Teton travel book in Austin, but hadn’t really planned it out, focusing on the Texas to Colorado part of the trip first. At Cherry Creek I had a phone call with my friend Dwight, who is from that area and goes back-country camping in Yellowstone with a group of guys every year. Turns out we had a few overlapping days when we would be there at the same time, and we both planned to stay at Norris Campground. So, we made plans to meet just after Labor Day at Yellowstone. On Wednesday, the 22nd, Bev and I packed up and headed to the airport. Initially we didn’t think that we could drive a motorhome to the airport (one other reason for the rental car idea), but my brother found out that we could drive to departures, which is on an upper level and has no low-clearance areas. We had to say a quick goodbye at the drop off area and I was off. Sad time. Now it was just Riley and me. While in the Denver area I wanted to run a few errands, including replacing the radio in the cab. The Alpine stereo that was there was overly complicated (not easy to set or select the pre-set buttons) and then it died a few days before leaving on the trip. Now that I didn’t have Bev to talk to I would really need to get a new stereo installed. The rig is set up with extra speakers behind the couches above the back window, so I can listen to the radio while relaxing in the evening. This is why car stereos with remotes are very handy. I was able to find the Pioneer model I wanted (with Ipod controls and USB port for charging) at the Best Buy in Loveland, north of Longmont, where I was staying at the Boulder County Fairgrounds. 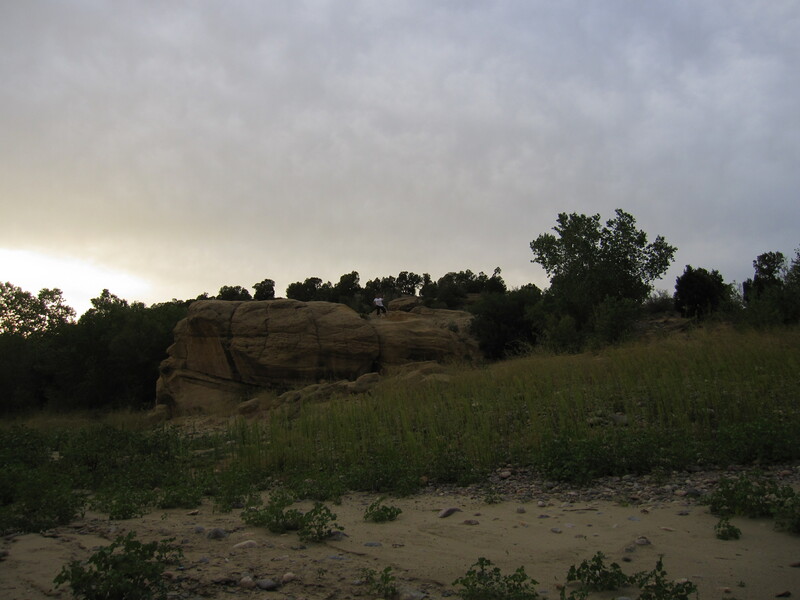 I had originally wanted to go to the Missile Site Campground in Greeley, but it was dry-camping only and the weather there was warm. I needed an electric hookup for A/C, so went to the fairgrounds site. 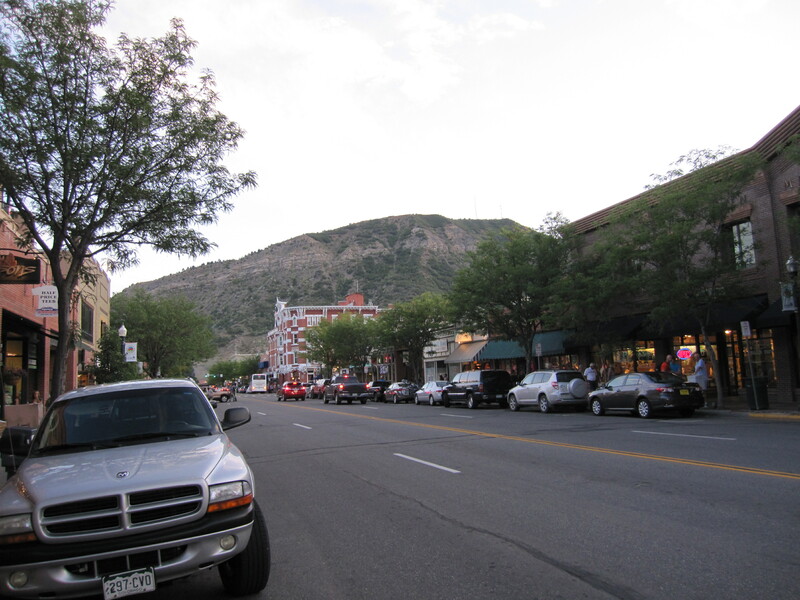 The next morning I would visit downtown Longmont (very cute main street), weigh the rig at the trucker stop (only 200 pounds under max weight, must dump some stuff soon), swing by Best Buy, and then head into Wyoming. 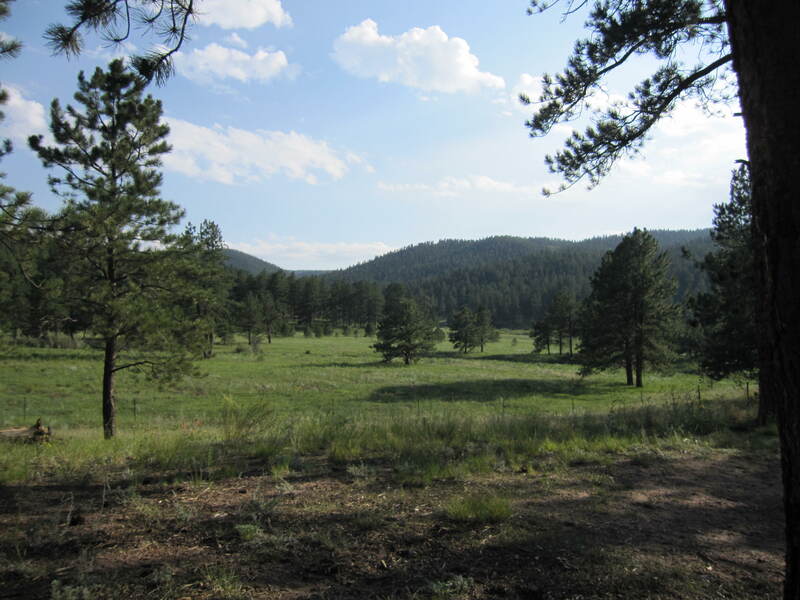 Mueller State Park was supposed to be very pretty, and very forest-y, my favorite kind. So, we headed out of Buena Vista on Hwy. 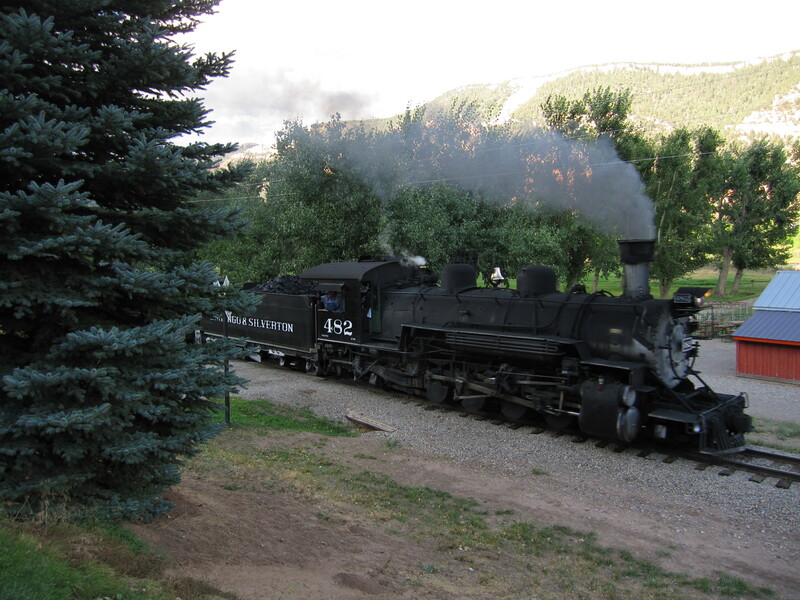 24 towards Colorado Springs. This was on Saturday morning, 8/18. We made a couple of stops: grocery store, Wilkerson Pass, etc. We got to Mueller about 12:30 or so. 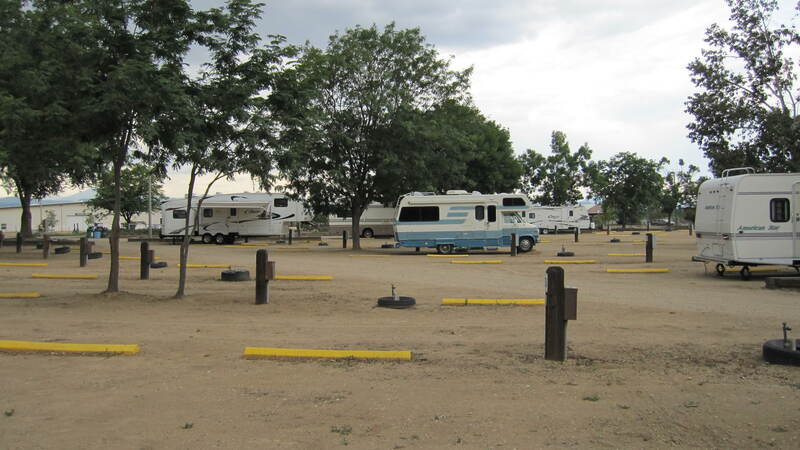 The campground was FULL! Darn! I should have tried harder to get there early, given that it was Saturday. 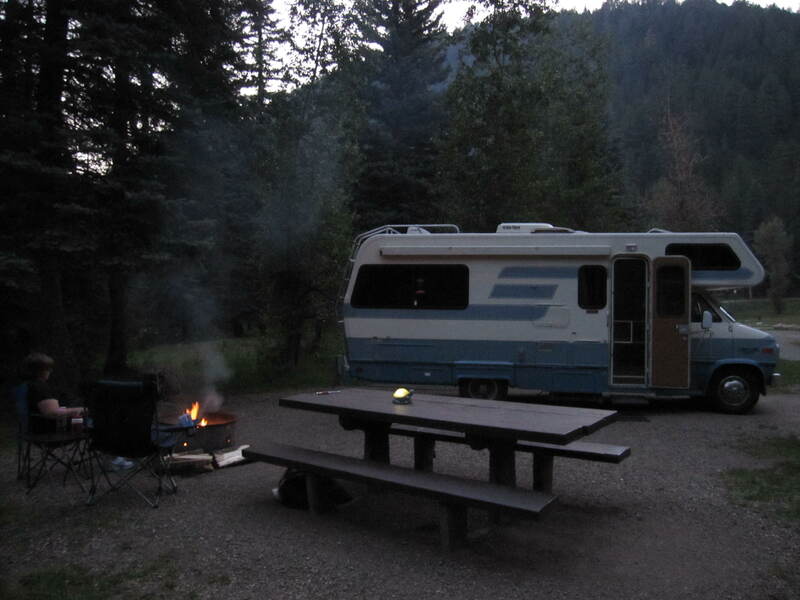 I knew there were some National Forest Service campgrounds in the area, so we went back to the town of Divide to fire up the Mi-Fi and Ipad to check AllStays for options. 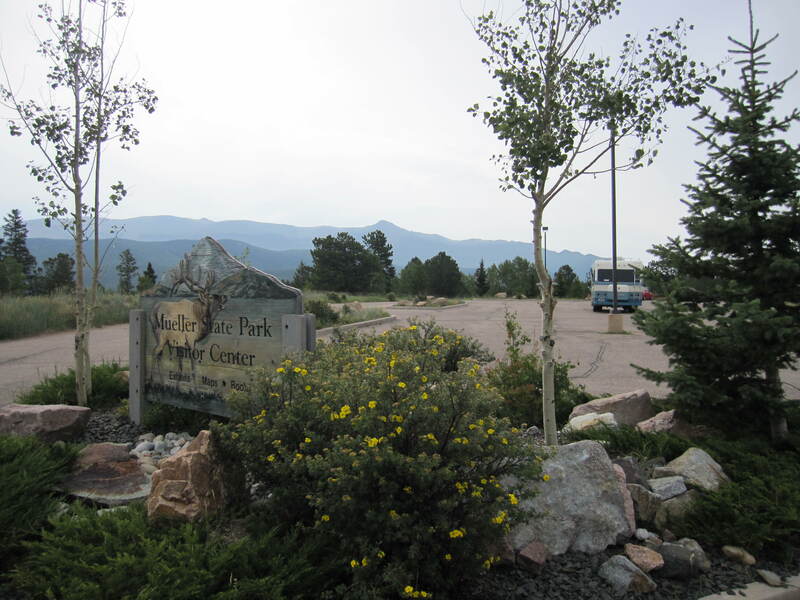 North of Woodland Park (a very nice city, by the way) is South Meadows Campground, so we headed there. The site was $20, with no hookups, but worth it. Check out the site. 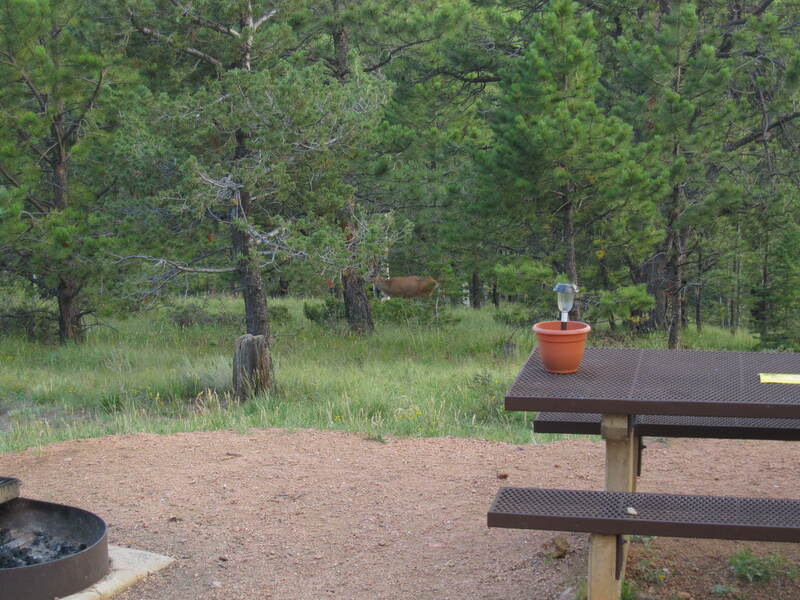 The camphost said it was the best site in the campground. The next morning we headed back to Mueller. Lots of campers head back home on Sunday mornings, so we were confident we would be able to get a site. The ranger working the check-in booth was the same lady who gave us the full campground news the day before, and this time she was happy to give us a site that she thought was a great location. It was. 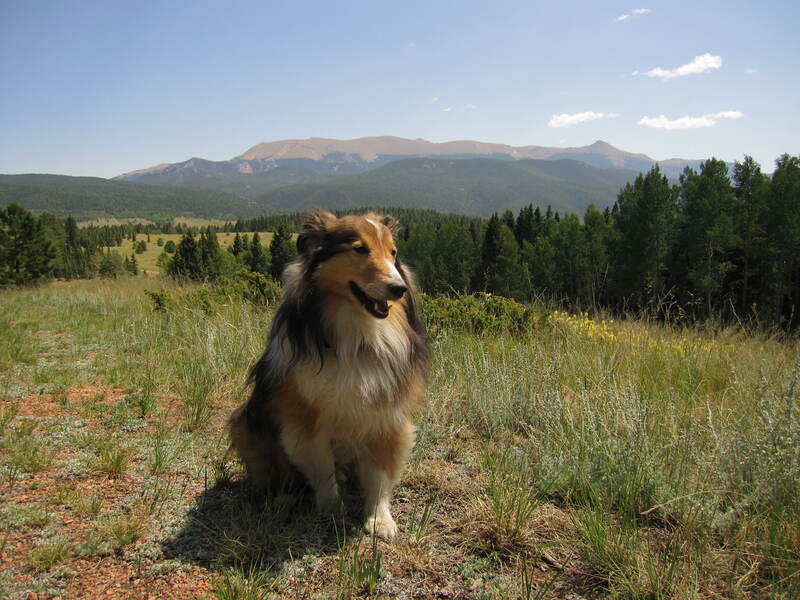 Mueller sits next to Pikes Peak, and most of the park has great views (backside views). Mueller has lots of trails, but dogs aren’t allowed. But, our site was special. There is a secret trail behind the site. 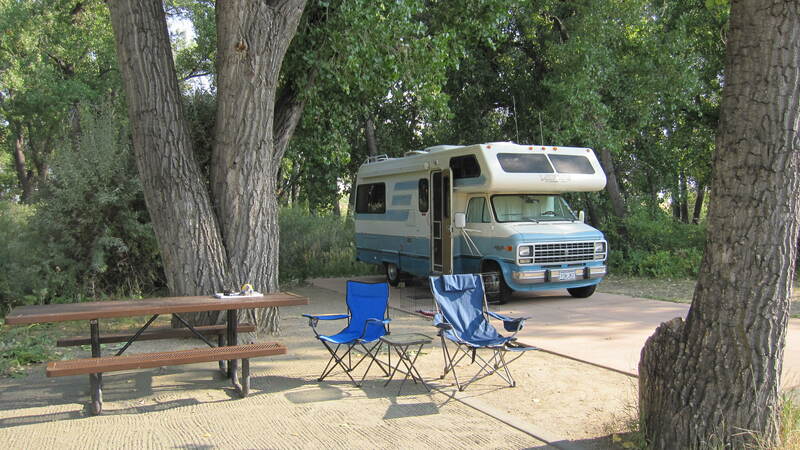 There was a solo woman camper next to us from Denver, who visited Mueller often. 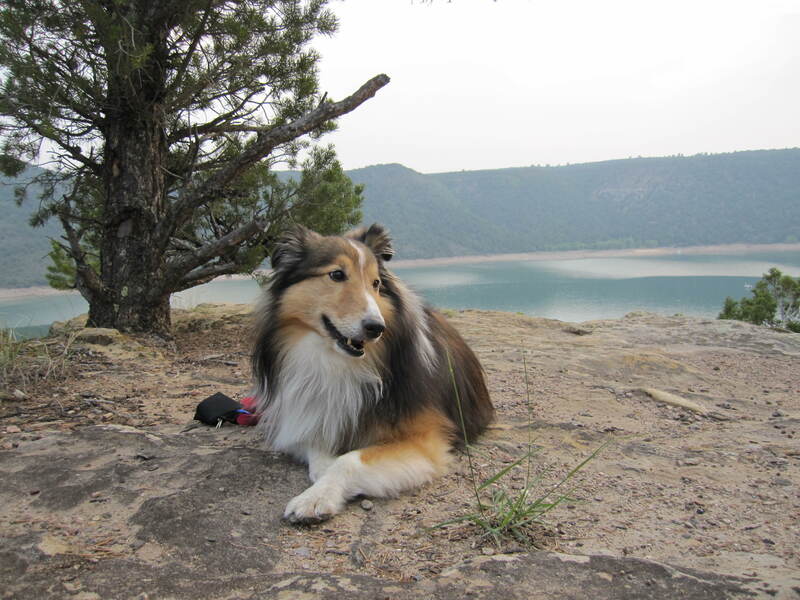 She said our site was the best in the campground, because of the secret trail. Somehow we kept getting the best sites! I’m not complaining. Mueller was a very nice park. I would have stayed longer, but we had reservations at Cherry Creek State Park in Denver for the 20th and 21st, before Bev’s flight out on the 22nd. So we headed towards Colorado Springs to pick up I-25 and on to Denver. From Durango we drove to Dolores. 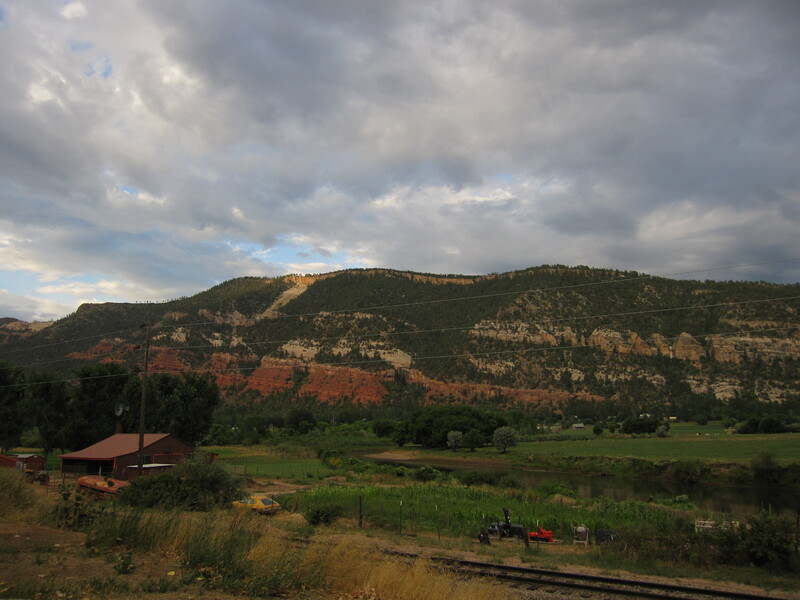 One of the items on the bucket list of my trip was to camp on the Dolores River, ever since I read about Bob’s trip to Colorado. (Bob is the prior owner of my RV. I found his blog a couple years ago and read about his travels.) 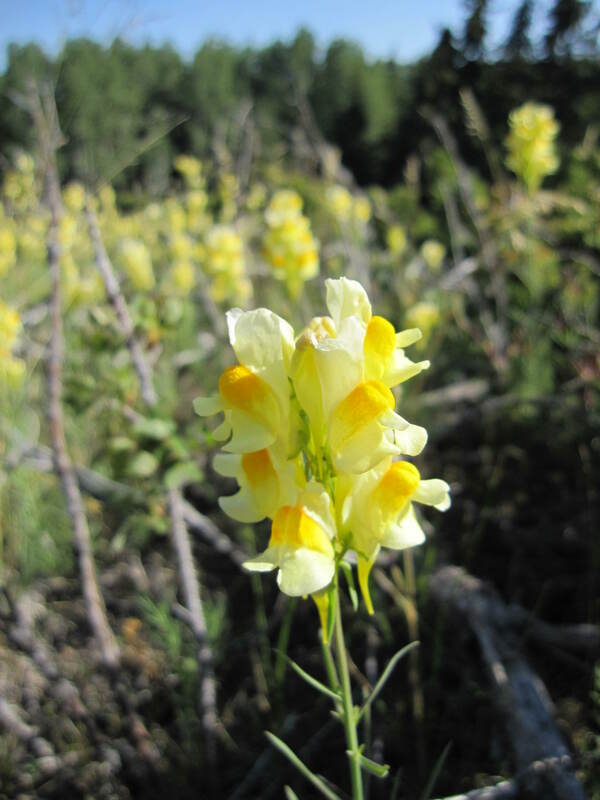 The drive was beautiful, especially the forest road off of Hwy 145 that leads to West Dolores Campground. We pulled in at about 6PM, hoping there would still be sites available. The camphost gave us 3 sites to choose from. One of them backed right up to the river. And it had electric hookup. We were very happy!! 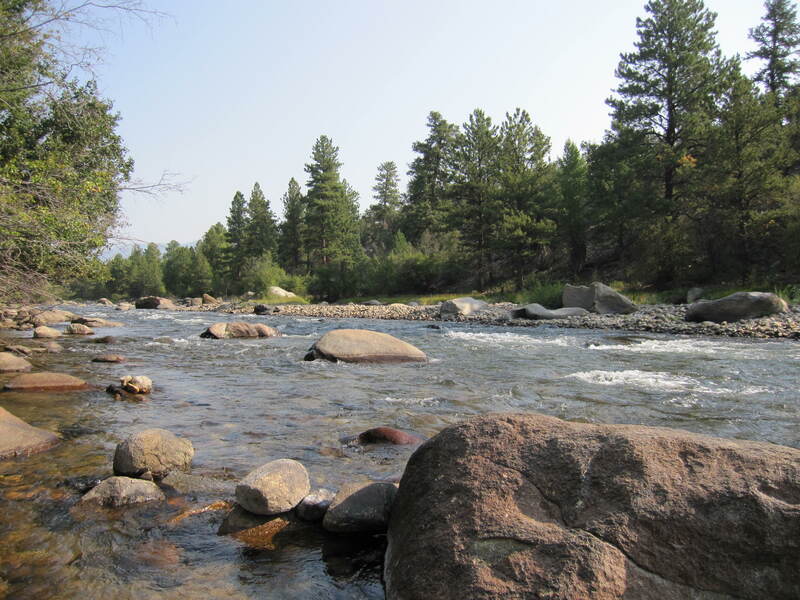 The sound of water rushing over rocks was constant. We decided to stay an extra day. The sites are $17 + $5 electric. 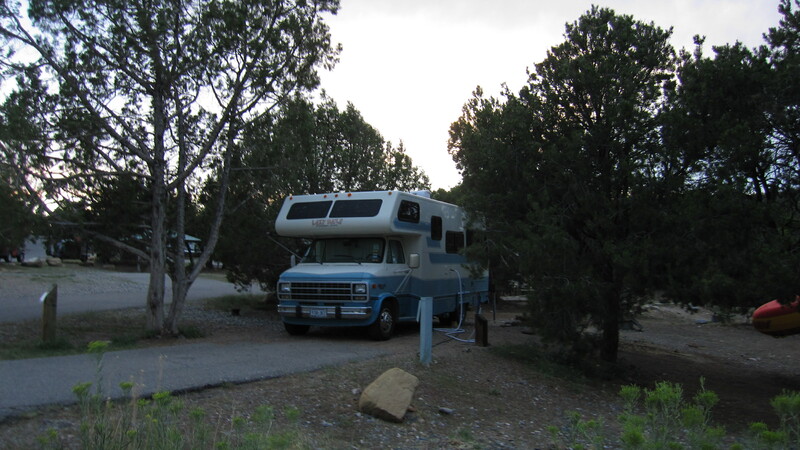 Not the great deal that New Mexico State Parks have, but the site was fantastic and we loved it. We even had a fire and made smores. I don’t know that I have ever had smores. Always heard of them, but never been a camper, so no smore making in my past. 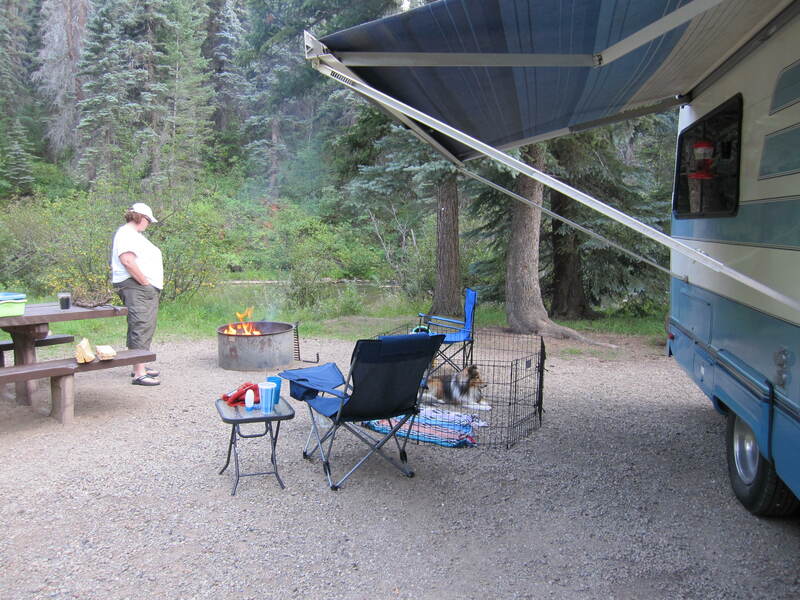 Perfection – House on wheels, site by the river, Riley chilling in his pen, Bev made a fire…. This is how close the river is. I’m standing in it. We had our windows open at night to hear the babbling river. On Thursday, the 16th, we headed north on 145 towards Ridgway. 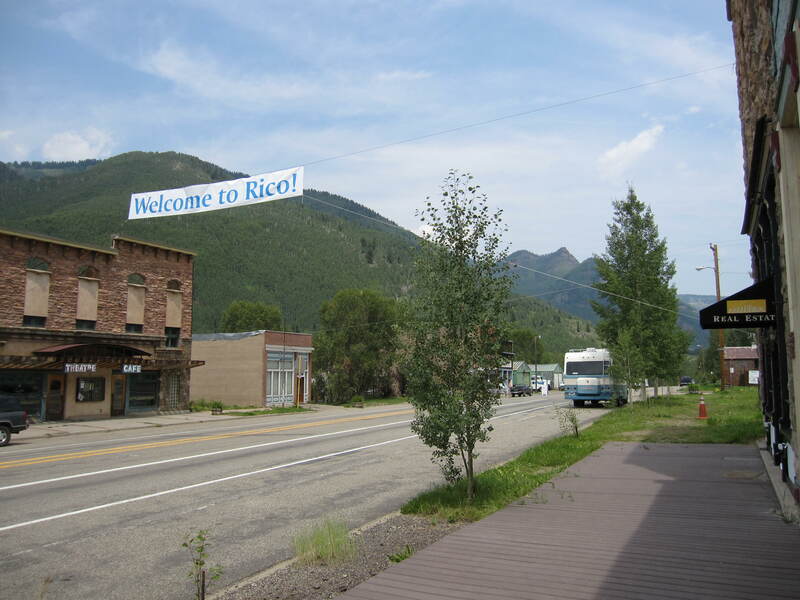 We stopped in Rico, a tiny, old mining town. We had no Verizon signal on my Mi-Fi device at the W. Dolores campground, so stopped at the cafe in Rico to use their WiFi. Bev took a cute picture of Riley there. Isn’t he handsome? 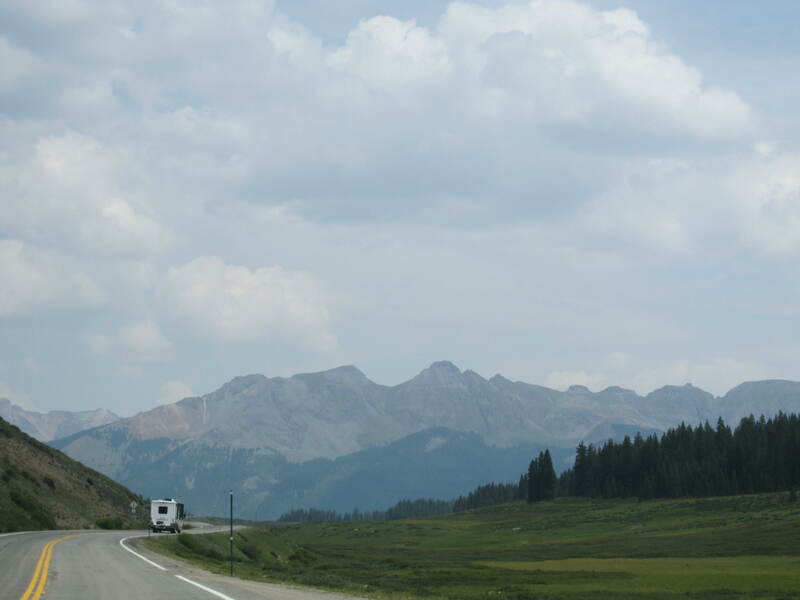 We drove through Telluride on the way. Just wanted to see it. Very touristy. Guess I didn’t take any pictures there. We went over Lizard Head Pass at 10,222 feet. 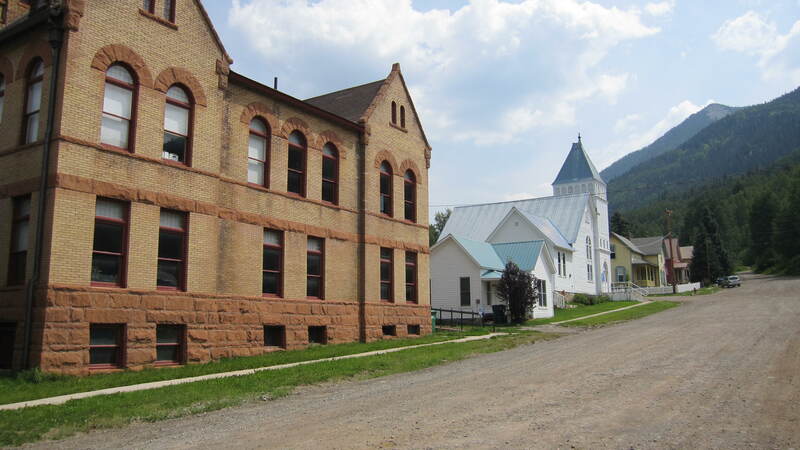 My friend Dwight had told me about Ridgway, as he has family there. 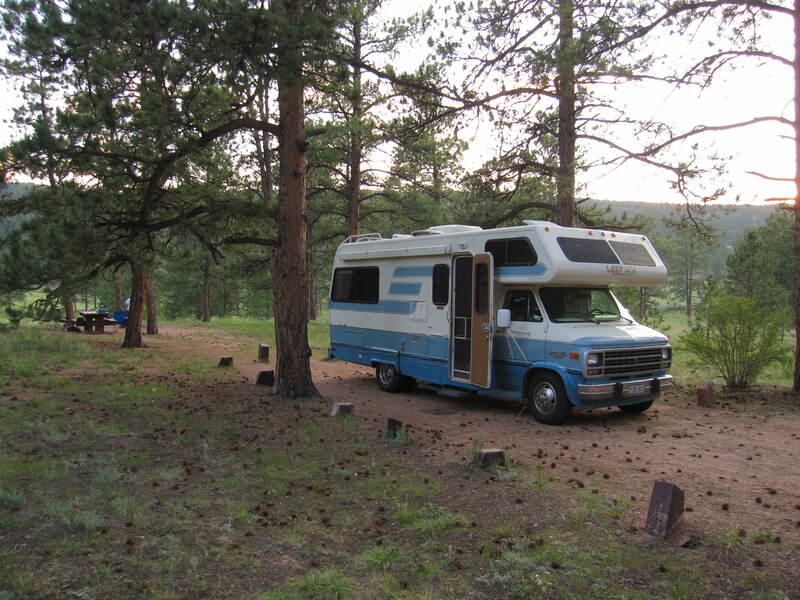 I had also read RV’ers say the state park there was nice, so we decided that would be the next stop. 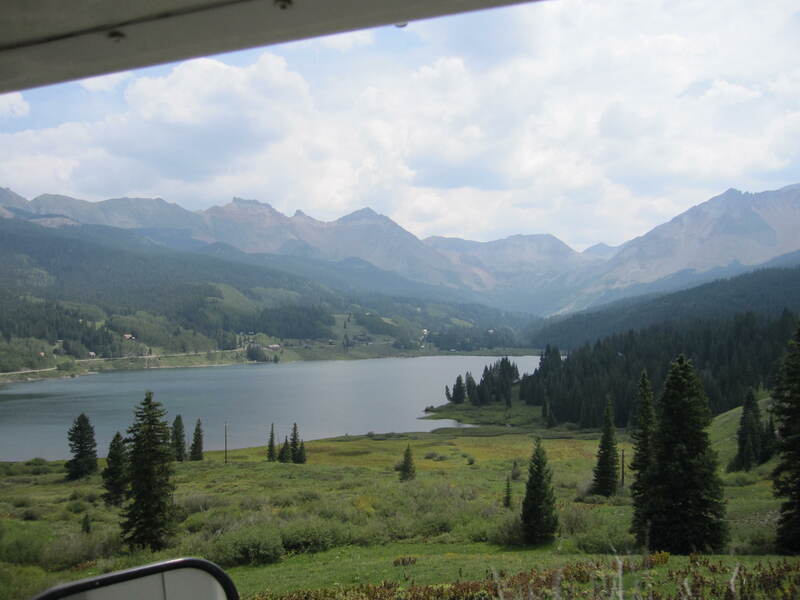 We were generally trying to go to places with nice scenery and cool weather as we drifted towards Denver, where Bev would fly home on the 22nd. Ridgway SP was nice, but a bit cedar/scrubby like Texas. 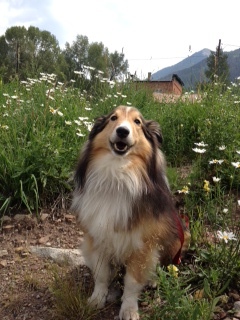 Riley on the hiking trail at Ridgway State Park in Colorado. 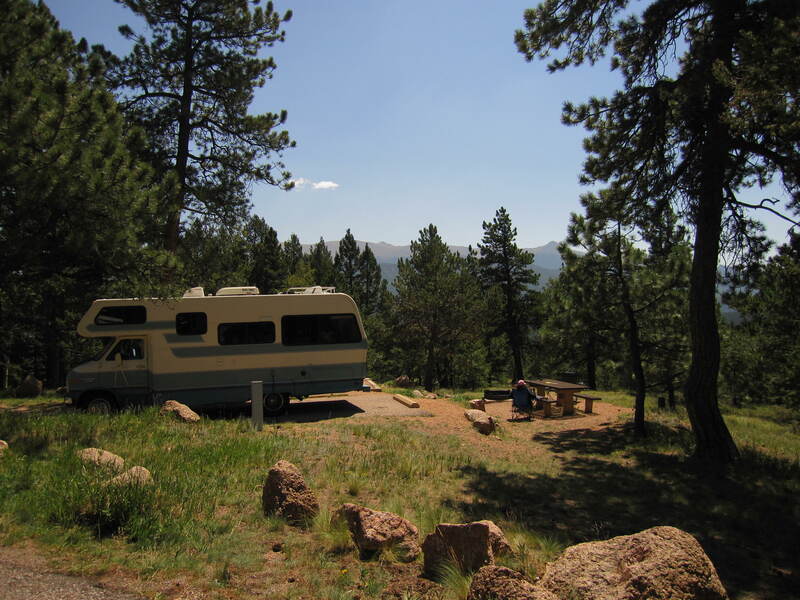 We stayed one night at Ridgway, then headed east towards Mueller State Park. 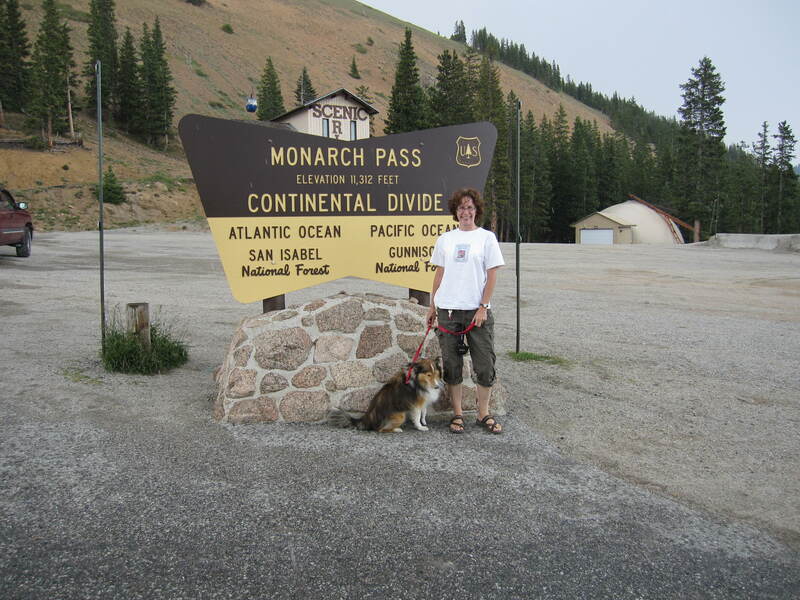 Along the way, we crossed the Continental Divide at Monarch Pass, 11,312 feet. Chugging up that road was … challenging. We got out to take pictures at the sign, and it immediately started hailing on us. Mountains certainly do make their own weather. We wanted to get to at least Salida. 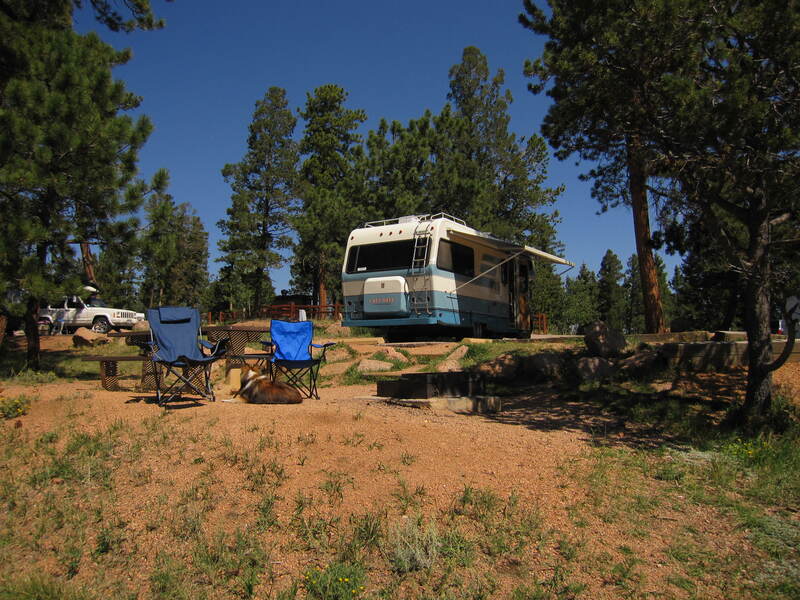 We found a commercial campground to stay at just north of Salida in Buena Vista – Arkansas Rim Campground. The river was right behind our site, but was down a hill. We followed a trail to the river. The RV Park wasn’t too nice, but was a parking spot for the night. 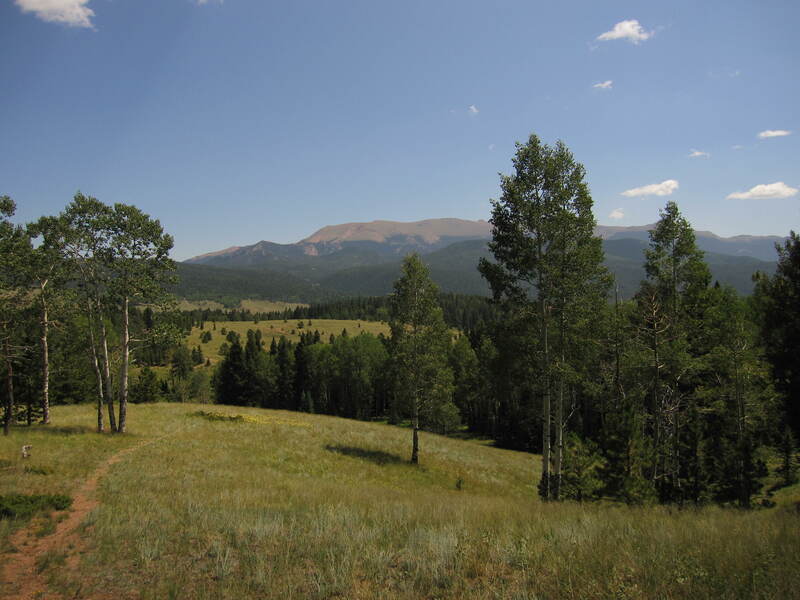 Next, we would head to Mueller State Park. Next we moved to Heron Lake State Park. 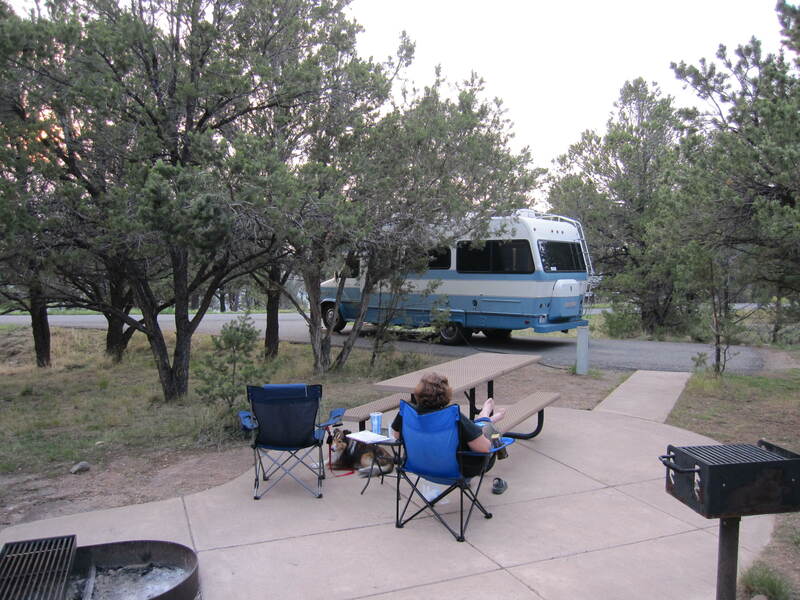 I have read about RV’ers that really like it there, and one of the ladies on the Solo Women RV Yahoo group I’m on was working there. So, I make a reservation for 3 nights. 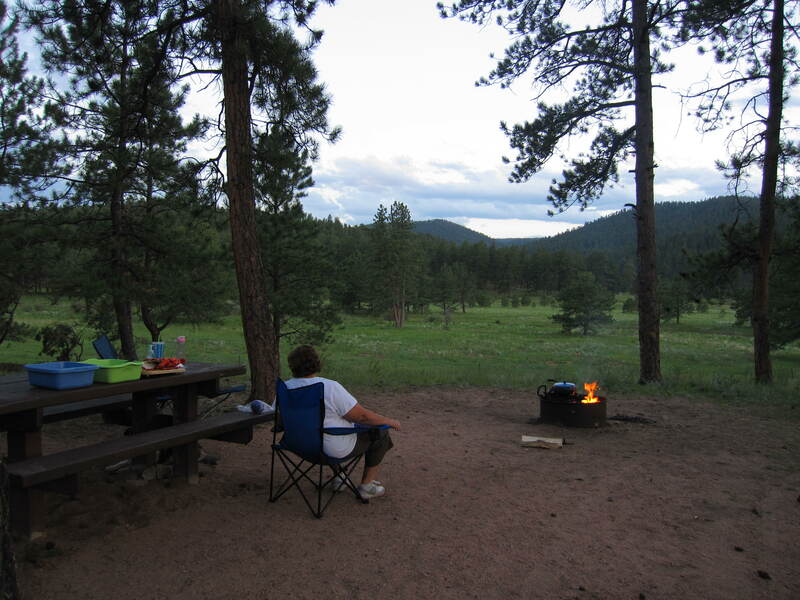 I looked at the available sites on the Gov reservation site, and photos of the sites on campsitephotos.com to see which to select. One thing I didn’t check was my coverage app. It shows where the Verizon coverage is, so I can see if my Mi-Fi device will work. Turns out Heron Lake is in a big donut of zero coverage. That might be OK most of the time, but not when I am just a few days away from closing on my house. I would need to be in communication with the realtor’s office and get the HUD docs for review as soon as they were ready. 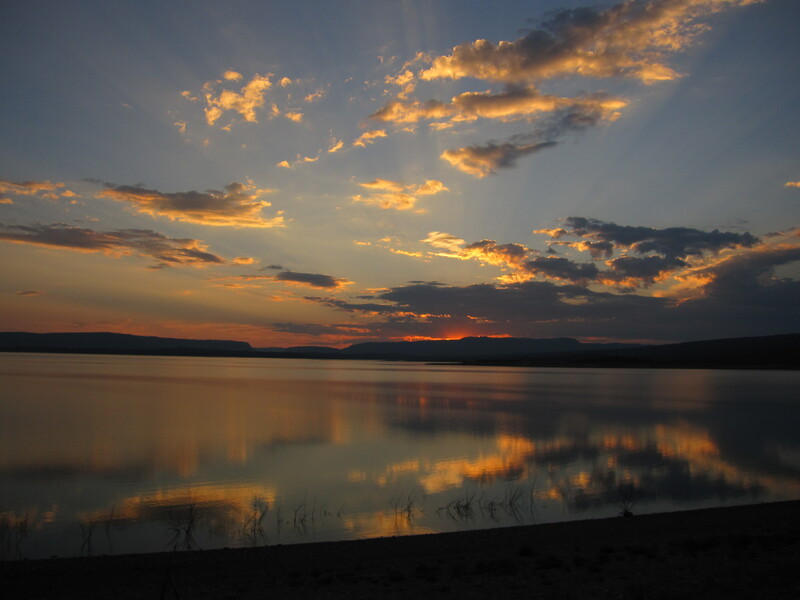 So, we just spent 2 nights at Heron Lake and moved to Navajo Lake SP, just south of Durango Colorado. Durango is where I planned to go for closing. 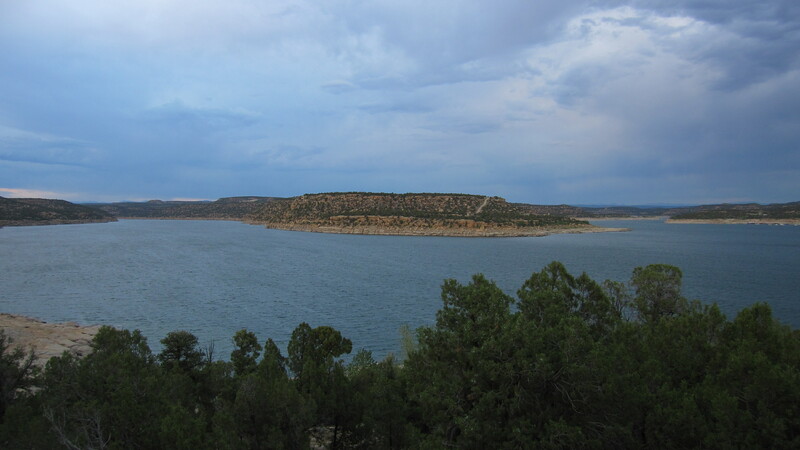 Navajo Lake is pretty big and there was a trail leading down to the water from the campground (which is on a bluff above the lake). Bev climbed on top of this HUGE rock. 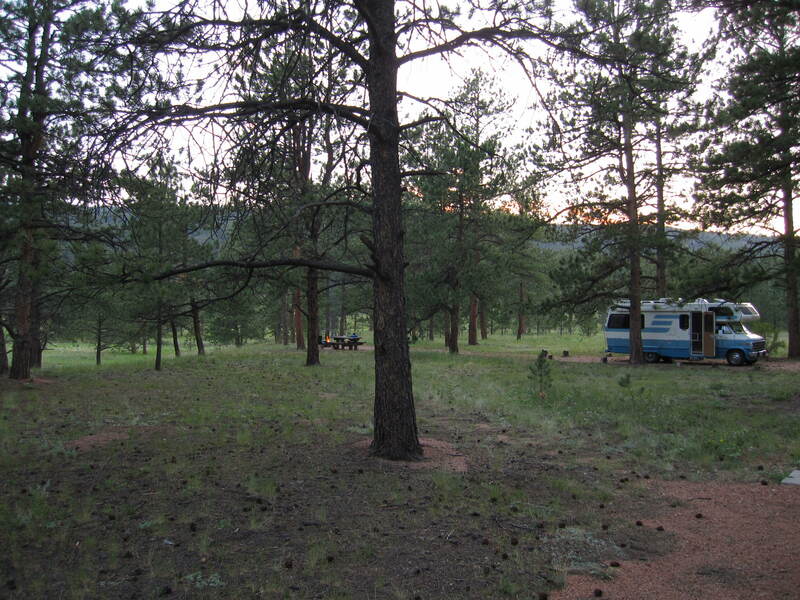 The campground is very twisty and I was glad to have a 22’ motorhome. I don’t see how big rigs negotiate the turns/sites in that park. The next day we drove to Durango, stopping at the Walmart on the way in. We hadn’t really decided on where to stay yet. There was a place south of town that we had found online the night before, but drove through and kept on going, hoping to find something not so run-down. While at the Walmart I fired up the Ipad and looked at my All-Stays app. 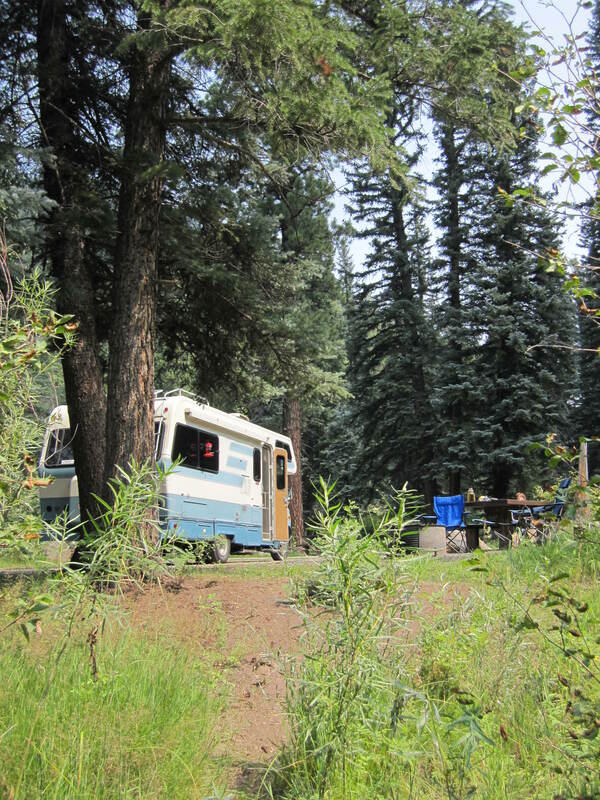 Found a commercial campground on the north side of town that listed they were on the trolley stop. We had noticed a trolley stopping in front of the Walmart. Called and found they had space available. So we stayed there Friday, 8/10 through Tuesday, 8/14 (closing day). 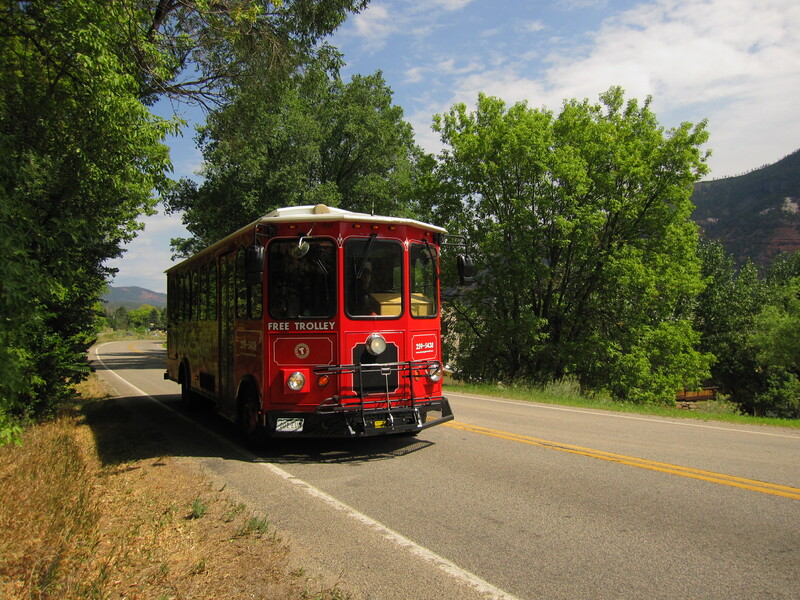 We would use the laundry, take the trolley into town as needed, and generally get things done. 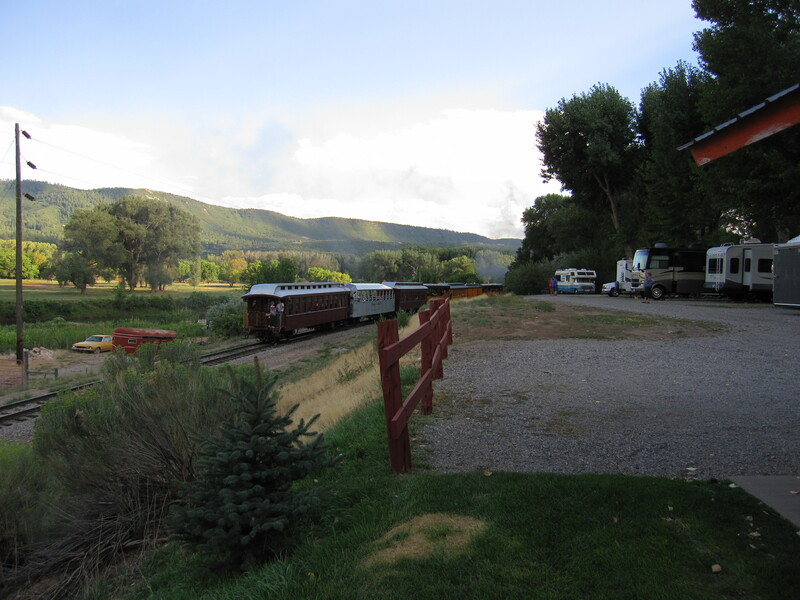 Turns out, it was also right on the Animas River AND the Durango-Silverton (tourist) railroad goes right through the campground. It was a fantastic site! We really loved Durango. View from our site. I especially like the old yellow pinto. My first car was a 1974 green pinto. On Tuesday the 14th, we loaded up, dumped the tanks, and headed into town. Checkout was at 11AM and my closing was at 4PM, so we had some time to kill. Of course there’s always a Walmart run. We also went by the information center. On the way out we noticed a squirrel just standing on the sign. I said that must be a little statue, then it moved his head. So Bev got a picture real quick. Little dude must have been waiting for a ride. 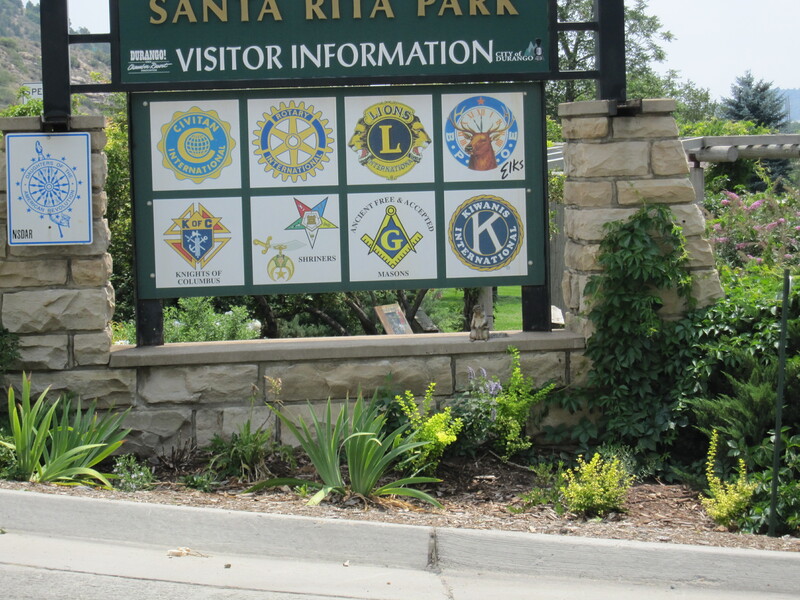 See the squirrel right under the Kiwanis seal? Durango has a really nice network of parks. 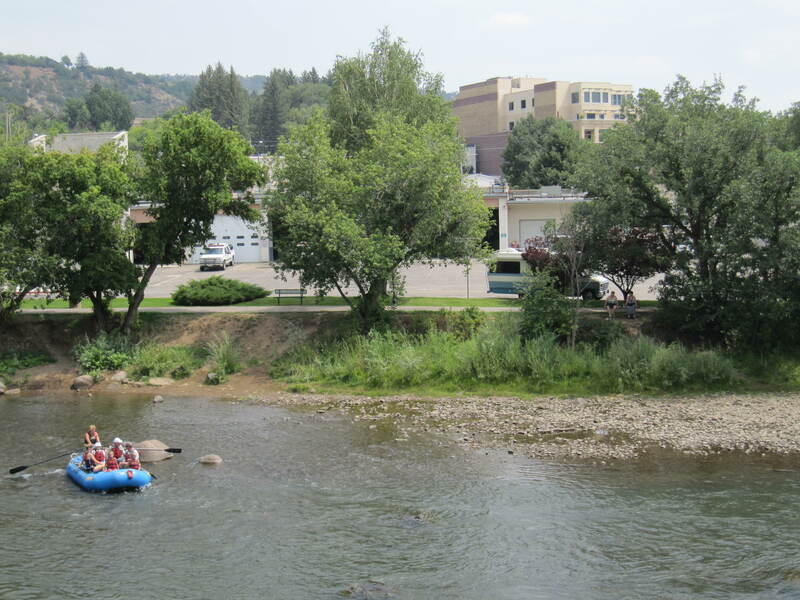 There is a hike and bike trail all along the Animas River, and there is a major skate park. We killed some time down at the park right behind downtown. 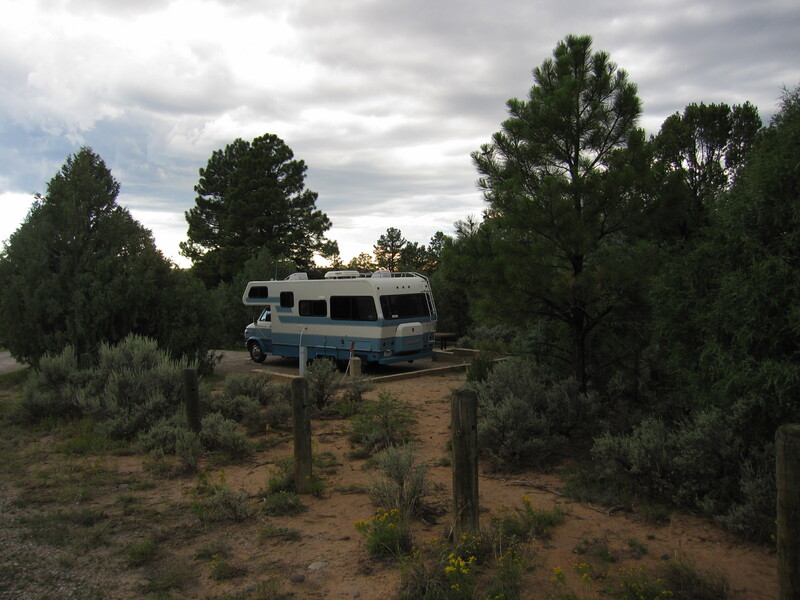 Then, as it got close to 4:00 we parked in front of the title company building, I went in to sign docs for about 15 minutes, and then we were off to camp alongside the Dolores River.